Prominent Whitehead Island, with its bleached, rugged granite shores, was a vital seamark for mariners long before its lighthouse was established. The 80-acre island marks the southwestern entrance to the important Muscle Ridge Channel in Penobscot Bay. The channel runs between the mainland and a dangerous archipelago of numerous islands and reefs, with Owls Head at its northeastern end. It was the favored route for the vessels that carried granite and other exports from local harbors. Congress appropriated $7,000 for a light station on Whitehead in March 1803. The specifications called for an octagonal wooden tower on a stone foundation, 30 feet high to the lantern deck, along with a wood-frame dwelling about 60 to 70 feet from the tower. The contractors Benjamin Beal and Duncan Thaxter constructed the buildings in the spring of 1804. Some sources state that the light went into service in 1807, but the first keeper, Ellis Dolph (or Dowlf) was hired in June 1804. The station had a scandal early in its history. It seems that Dolph had a side business selling oil intended for the light. Officials became suspicious as Dolph ordered larger and larger quantities of spermaceti oil, and they discovered that storekeepers in the nearby town of Thomaston had been buying whole barrels of oil from the keeper. Needless to say, Keeper Dolph was immediately dismissed. Situated at the entrance of Penobscot Bay. The Lantern is elevated 50 feet above the level of the sea, and contains a fixed light; but owing to the contracted size of it, only a few of the Patent Lamps can be placed in it, and those without the Lens. This Light cannot be seen at more than 4 or 5 leagues distant. Whitehead Island is one of the foggiest spots on the coast, averaging 80 days of fog a year. In 1829, nearly a decade after West Quoddy Head Light got one of the nation's first fog bells, Whitehead got its bell. After an appropriation of $6,000 in March 1831, the tower and dwelling were rebuilt. Jeremiah Berry, a mason from Thomaston, constructed a rubblestone tower, about the same height as its predecessor, with a wrought-iron octagonal lantern. A stone dwelling was also built, with three rooms downstairs and three small rooms in the attic. The new lighthouse went into service in September 1831. In 1838, new equipment was installed that created the first tide-driven fog bell. The "perpetual fog bell," invented by Andrew Morse, was run by a Rube Goldberg-type combination of timbers, chains, and weights. Left: This Jones fog bell apparatus was installed in 1853. Photo courtesy of Dave Gamage. Without the assistance of the bell I should have been compelled very frequently to have stopped my passage... I sincerely hope these bells will be placed all along this dangerous coast. In 1842, civil engineer I. W. P. Lewis visited the station and found the "perpetual fog bell" no longer in operation after it had been damaged in storms. The keeper had tied a line to the bell's clapper and run the line into his bedroom, where he sometimes amused himself by sounding the bell from his bed. A more traditional fog bell was installed in 1853; the bell was replaced by a steam-driven fog whistle in 1869. Right: In this photo, circa 1964, the Whitehead fog bell is heading for its last resting place (in parts unknown). This was the standby bell put in place when the first steam whistle was installed in 1869. It appears to be the the same bell that was once part of the Jones fog bell apparatus installed in 1853, seen above. Behind it in the photo is one of the two diaphragm air horns. Photo and information courtesy of Dave Gamage. In 1852, a new 41-foot lighthouse was built along with a new wooden keeper's house. A third-order Fresnel lens was installed in 1857. Isaac Grant became keeper in 1875. Grant's wife was Abbie Burgess Grant, who had gained fame as the heroine of Matinicus Rock. Abbie served as assistant keeper under her husband. In 1881, Isaac Grant rescued two men whose schooner had capsized near the island. The keeper was awarded a silver medal by the United States Lifesaving Service for his heroism. Above: U.S. Coast Guard photo. 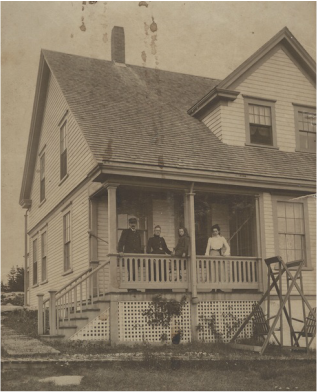 Left: Assistant Keeper Walden Hodgkins and family on the porch of the assistant keepers' house, circa 1900. Courtesy of Marshall Coppage. Mary Bradford Crowninshield's 1886 book, All Among the Lighthouses, reported that Isaac Grant was "one of the best keepers on the coast; that his light was always well cared for, and his fog-whistle was never out of order." Arthur Beal became keeper in 1929, after 10 years as an assistant keeper at Matinicus Rock. Beal would go on serve for 21 years at Whitehead. Dave Gamage, who currently lives much of the year in a small house on the island, is the grandson of Keeper Beal. I clearly remember lying in bed at night in my little room and listening to the continual sounds of the ocean waves crashing on the rocks nearby. And there was the clanging of the bell buoy anchored at a ledge in the channel that would lull me to sleep. In the morning I would awaken to the aromas of breakfast rising from the kitchen below through the floor register openings, especially when grandmother was making donuts. There are many wonderful childhood sights, sounds and odors interwoven in my cherished memories of this special lighthouse. In 1933, the old steam boilers that ran the fog signal were replaced by two internal combustion engines operating an air compressor. Right: Frank Jellison was assistant keeper and then principal keeper., 1890-1905. Courtesy of Joan Jellison. Two new foghorns were installed, one pointing out to sea to the south and another facing northeast toward the Muscle Ridge Channel. At the same time, an electric light replaced the old incandescent oil vapor lamp inside the lens, and the keeper's dwellings were supplied with electricity. 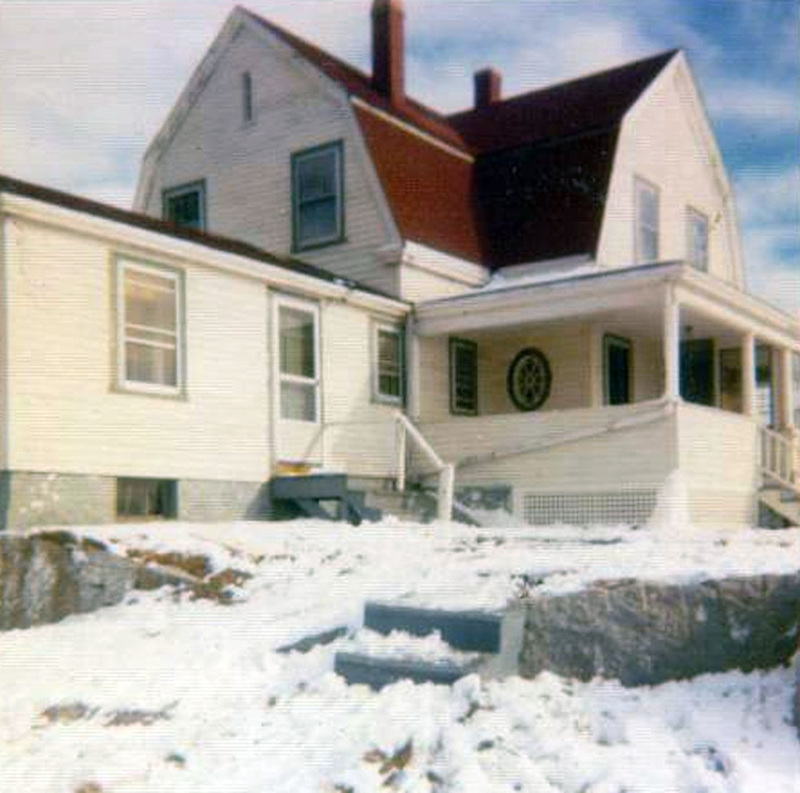 Under the Coast Guard, Whitehead Light eventually became a "stag" males-only station instead of a three-family station. The 1899 Dutch Colonial principal keeper's house was razed, but the 1852 assistant keepers' duplex house near the tower still stands. In August 1958, a Coast Guard keeper, Russell Lane, teamed with local resident Dave Gamage to rescue five young people--aged 14 to 20--whose sailboat had capsized while on a jaunt from a sailing school. They were clinging to the side of the boat when they were rescued, and it was reported that some of them probably would have lost their grip within a few more minutes. 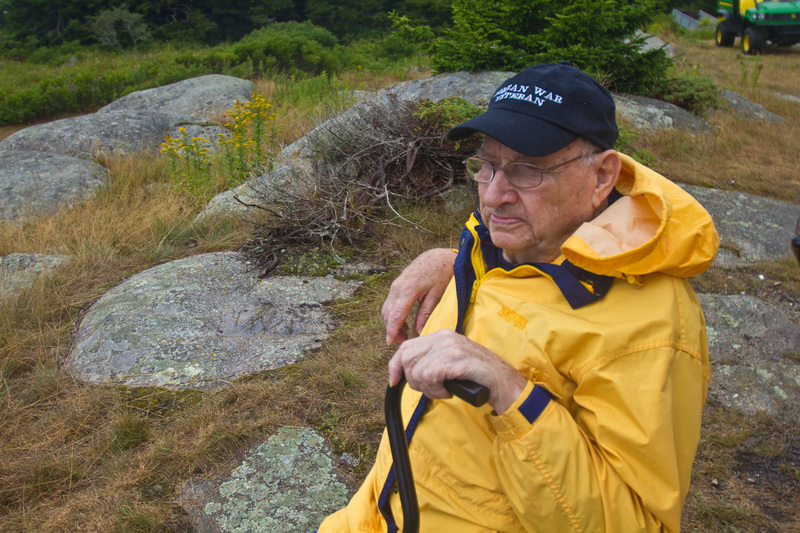 Former Coast Guard keeper Russ Lane during a visit to the island on August 22, 2015. L to R: Sandra Lane, Russ Lane, Sr., Russ Lane, Jr., and Dave Gamage. August 22, 2015. Ken D. Johnson was a Coast Guard keeper at Whitehead 1979-81. Johnson took part in a daring rescue one early December morning in 1980. 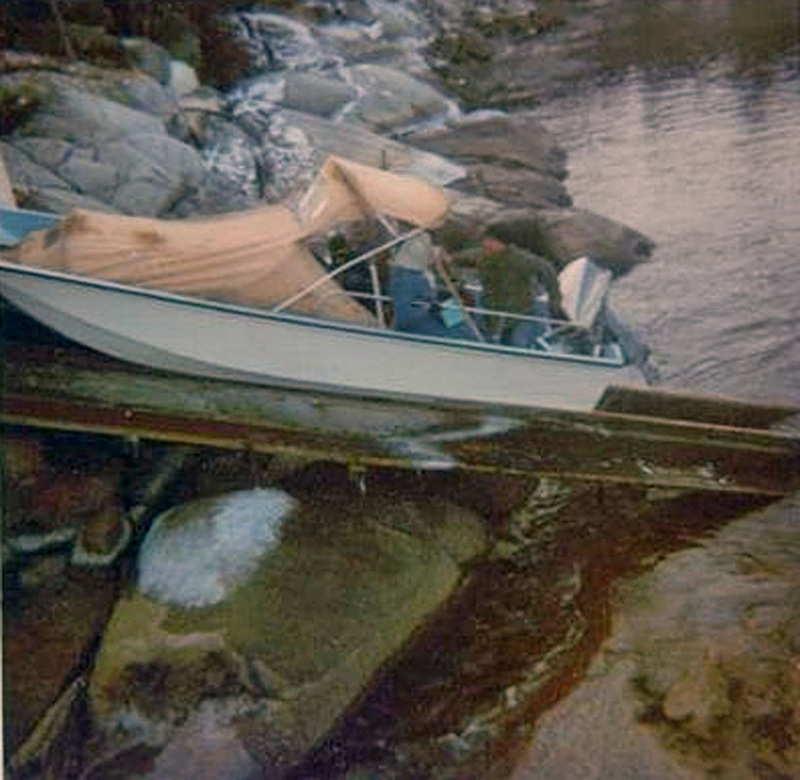 The Coast Guard station at Rockland phoned Whitehead to report that a lobster boat, with two men aboard, was in danger of sinking in the harbor at Spruce Head. With the seas running eight to ten feet, the Coast Guard was unable to send out their 44-foot motor lifeboat. Instead, Johnson took out the light station's 14-foot Boston Whaler. He reached the two men and took them safely to shore. It was the last known rescue performed by a Coast Guard crew at Whitehead. The 1899 principal keeper's house has been demolished. One of the station's boats on the boat ramp. Photos courtesy of Ron Upton, Coast Guard keeper at Whitehead from September 1972 to May 1973. The light was automated in 1982, the keepers were removed, and the Fresnel lens was replaced by a modern optic. Left: Whitehead Light was converted to solar power in 2001. On October 11, 2000, CWO Dave Waldrip and Harry Duvall of the U.S. Coast Guard met on the island with Dave Gamage and Ben Swan of Pine Island Camp to plan for the location of the solar array. L to R: Ben Swan, CWO David Waldrip, Harry Duvall, Dave Gamage. Photo courtesy of Dave Gamage. The Fresnel lens, manufactured in Paris by L. Sauter, is now at the Maine Lighthouse Museum in Rockland. Whitehead Light was included in the Maine Lights Program authorized by Congress and coordinated by the Island Institute of Rockland. In December 1997, the Maine Lighthouse Selection Committee announced that Whitehead Light would be transferred from the Coast Guard to Pine Island Camp, a historic boys' camp situated on Pine Island in Great Pond of the Belgrade Lakes. The owners of Pine Island Camp, the Swan family, had bought 70 acres of Whitehead Island in 1956, and campers have been visiting the island ever since. 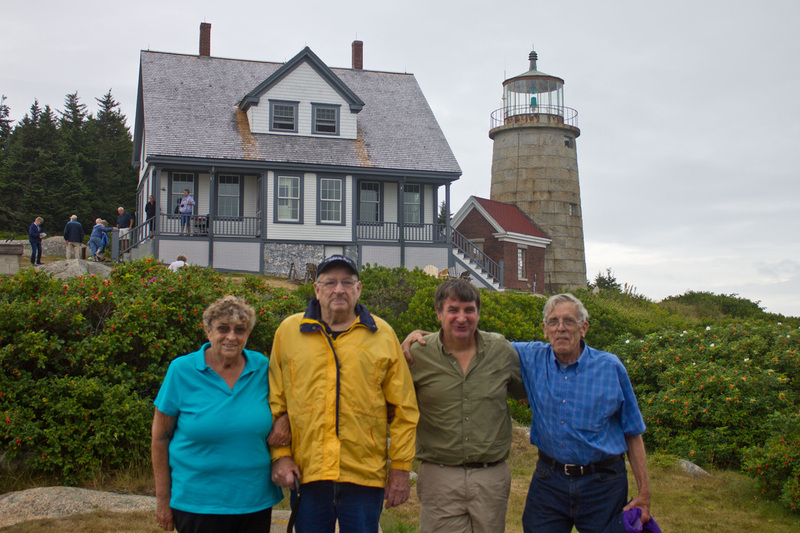 Under a work program the campers helped restore the lighthouse and keeper's dwelling. The light was converted to solar power in 2001. The lighthouse is difficult to see from shore, but some of the tour boats and schooners in the area pass the island. Restoration of the keeper's house was completed in 2008. There are now adult programs offered at the light station in summer, and the station is available for rent during certain periods. Details can be found at www.whiteheadlightstation.org or by calling (207) 729-7714 or (207) 465-3031.